It is important to know and track your BMI because it is one of the useful indicators of your health status and risk levels. Use the calculator on this page to find out yours! Choose the measurement system (Metric or Imperial), then enter your current weight and height. Submit to calculate your BMI. Body mass index (BMI) is a measure of body fat based on your weight in relation to your height. It is therefore an assessment of your body fat levels. 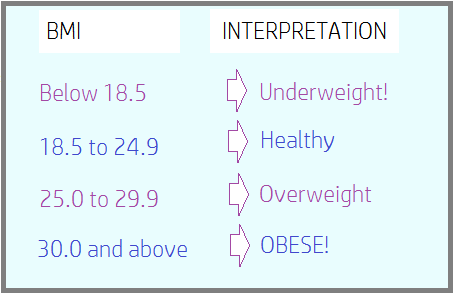 See the interpretation below, for adult BMI categories. If your BMI is less than 18.5, you are UNDERWEIGHT. Try to add some weight. It is highly recommended that you consult a dietician or a nutritionist for advice on how to effectively and safely add your weight. If your BMI is 18.5-24.9, your weight level is HEALTHY! Keep it there. If your BMI is 25-29.9, you are OVERWEIGHTand should start losing some of that fat. Reduce your health risks by cutting down weight using safe methods. Seek the advice of a dietician or nutritionist. BMI of over 30? Not good. This means you are OBESE. You are likely to face health risks and you need to loose substantial weight as soon as possible. It is advisable that you seek the counsel of your health care provider to ensure you lose weight in a controlled manner to avoid drastic weight losses that may lead to complications.